For use with extended wear bonding only. This adhesive can easily provide up to 4 weeks of super-strength attachment. 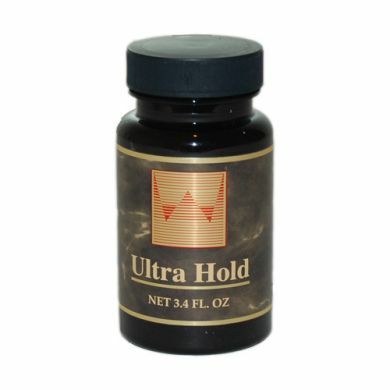 Ultra Hold isn't only the name, BUT also a great description of what you'll get! Although it's on the expensive side, anyone who has had problems getting a long-lasting bond using other adhesives will LOVE the strength and security offered by our Ultra Hold Glue. Ultra Hold Ulue is also made from a waterproof, "non-yellowing" formula and comes in a dark-colored 3.4 oz glass bottle with a brush-on applicator. For easy application, use with a pop sickle stick. Directions Since the fluid is thicker than most, we highly recommend using only a single, thin layer. Allow to dry before placing the lace wig on head.